The company will offer guided river trips through the heart of the rugged Kalmiopsis Wilderness using inflatable kayaks. Accessing the remote put-in will require a challenging hike deep into the Chetco River canyon. 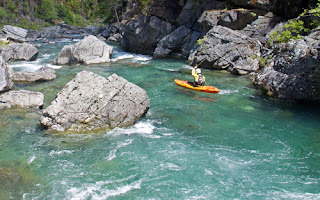 Not since Gold Beach outfitter Allen Wilson (now retired) ran inflatable kayak trips in the late 1990s has this wilderness river trip been offered. Damage to trails in the wake of the Biscuit Fire was too great for Wilson to resume his pioneering operations. However, in recent years, trail restoration efforts by the Siskiyou Mountain Club have opened up some of the old routes through the Kalmiopsis Wilderness. Northwest Rafting Company has contributed to this labor-intensive effort and plans to use the restored trails for river access once again. Zach Collier, owner of the Northwest Rafting Company, runs rivers around the world –recently in Bhutan and Siberia —but he loves the challenging whitewater, rugged canyons, and crystal clear water of rivers that flow from the Kalmiopsis Wilderness. In fact, he’s been making it a personal project to kayak all the area's rivers and even some of the creeks. It was through his personal kayaking adventures that he decided that he wanted his company to be able to offer the unique wilderness trip to his most adventurous whitewater customers. Collier is a staunch adherent of Leave No Trace camping practices, and his commercial trips will be following state-of-the-art wilderness ethic. With this mention in USA Today, the National Wild & Scenic Chetco River adds another pearl to its string of accolades in the national press. It has also been mentioned in the The New York Times (in an OpEd about the need for mining reform) and in National Geographic in an article about National Wild & Scenic Rivers. Given the river’s extraordinary and nationally significant clarity, beauty and wildness, it’s no surprise!